In the Pacific division, you should probably just assume everything you say is being recorded. 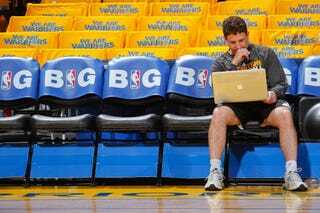 The firing earlier this month of Warriors assistant coach Darren Erman couldn't have been more mysterious. It was officially "a violation of company policy," and GM Bob Myers said it was a specific and serious transgression. "We were unaware, and when made aware, forced to act," Myers said. Well, here you go. ESPN reports that Erman was secretly recording conversations between coaches and players. Sources said Erman, who was coach Mark Jackson's second assistant, would record coaches' meetings, meetings between the coaches and players, and informal discussions among coaches that took place in the team's coaches room — all without the participants' knowledge. "He was taping everything," one source said. "Taping pregame speeches wouldn't have been that bad, but he was taping guys just sitting around talking in the coaches' office."